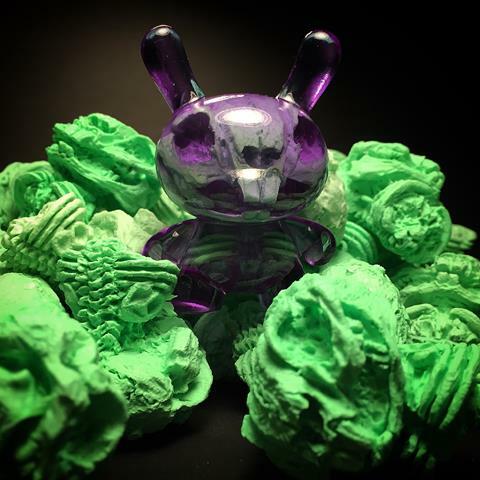 Artist Brent Nolasco calls upon his multi-faceted palette to create these Forget Me Not pieces, an 11-inch tall and 6-inch wide evolution of Nolasco's Bun Bun design. 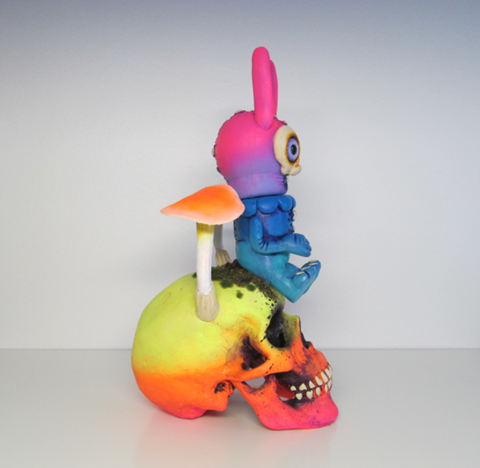 The rotocast resin Bun Bun figures sit upon a skull adorned with plastic mushrooms, synthetic grass, and wood chips. 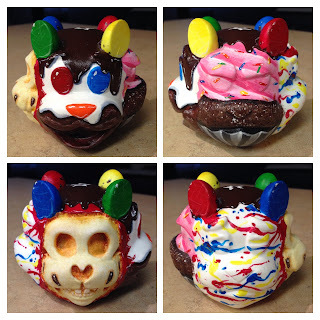 Not to mention the glass eyes set within each Bun Bun's head! Limited to an edition of 5 pieces, each has been hand-painted in acrylics and sprays to approximate each other as precisely as possible. This New York Comic Con exclusive will be available solely from Clutter Magazine's NYCC booth #603 for $150 apiece! 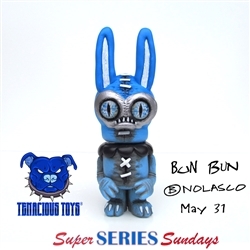 You can also pick up the Tenacious Toys exclusive Bun Bun by Brent Nolasco for $75 right now in the Tenacious Toys online store. Swiss artist Pepe Hiller loves to create pieces of art using wood. His latest sold out release is called RAKU. 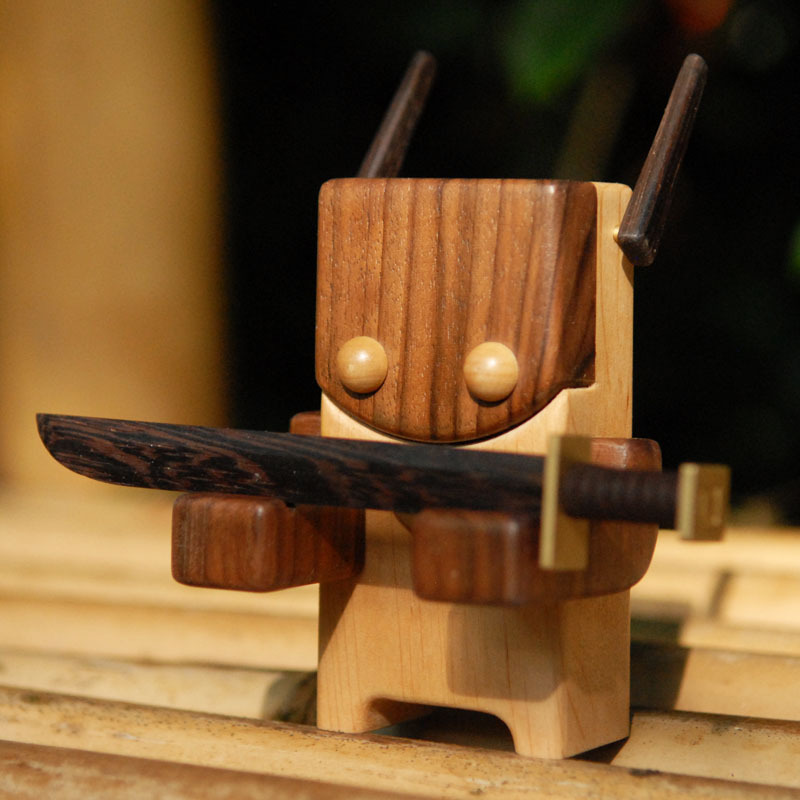 Limited to just 5 handmade pieces, RAKU is a 5" wood toy that was priced at only $120 plus shipping. RAKU is made out of a various types of wood, including alder, smoked oak wood and walnut. 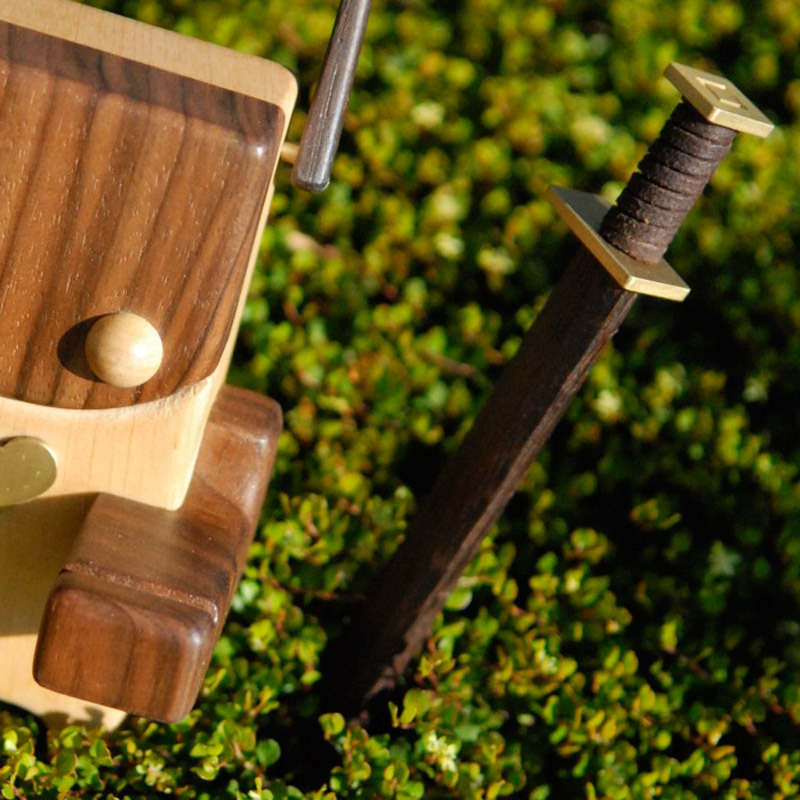 RAKU also features a brass hearth on it's chest, while the sword is made out a beautiful wenge wood, brass parts and a leather handle. "RAKU appreciate the various moods and sentiments suggested by the snow, the moon, and the trees and flowers, as they go through the transformation of seasons, appearing and disappearing, blooming and withering. If RAKU uses his sword, he makes it serve to give life to others. And while fought on many battlefields his true passion and mastery is brewing the finest and most delicious tea in all the seven woods. You can watch him listen quietly to the boiling water in the kettle, which sounds like a breeze passing through the pine needles. Legend has it that if you drink a bowl of tea together with RAKU you will become oblivious of all worldly woes and worries." 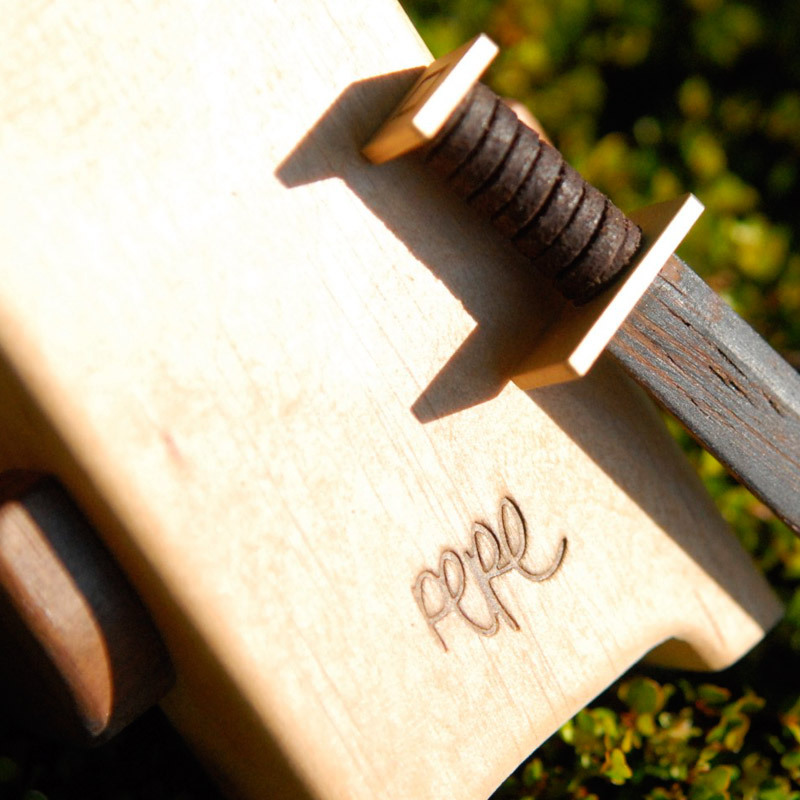 Be sure to follow Pepe Hiller on social media if you don't want to miss out on any future release Pepe will have. 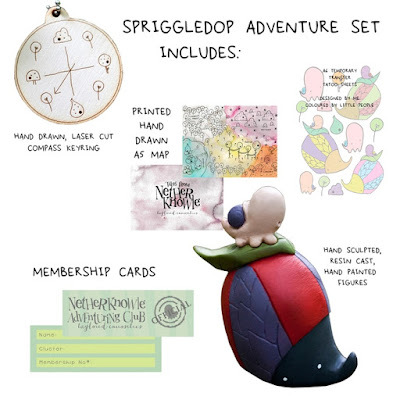 With 2 weeks left in the Kickstarter Campaign for Spriggledop Adventuring Club by Taylored Curiosities, there are some updates available. With reward tiers ranging from around $3 up to $84, there are many different rewards to choose from. Added to the list of rewards are 10 Limited Edition Glow in The Dark sets, exclusive to the Kickstarter Campaign. 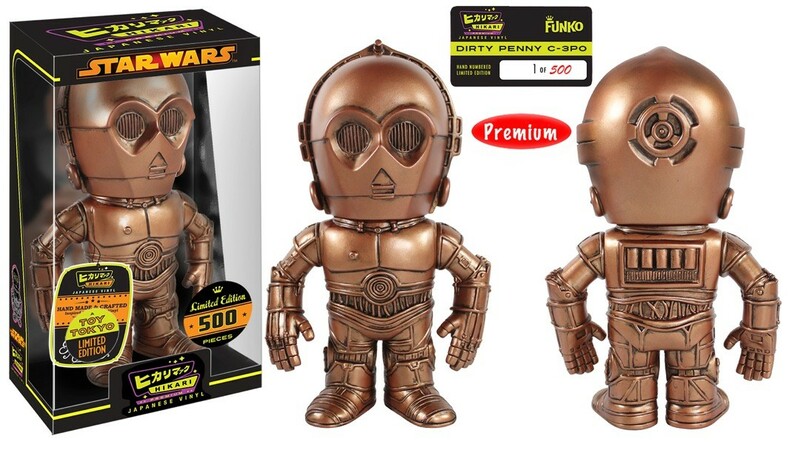 The GID reward tier is only $64. Another update is the choice of colors now available for those who are pledging for the hand painted sets. The spriggledop can be any of the following colors: purple, red, blue, peach, or pink. Color choices are made after the fully funded campaign is ended. Something else to note is that all the complete sets come with a printed map, laser cut compass, personalized membership card and temporary transfer tattoos. Everything is hand drawn and handmade by Taylored Curiosities in the UK. For those who haven't checked out the kickstarter, be sure to head on over and possibly pledge for one of the many cool rewards offered in the Spriggledop Adventuring Club Kickstarter. 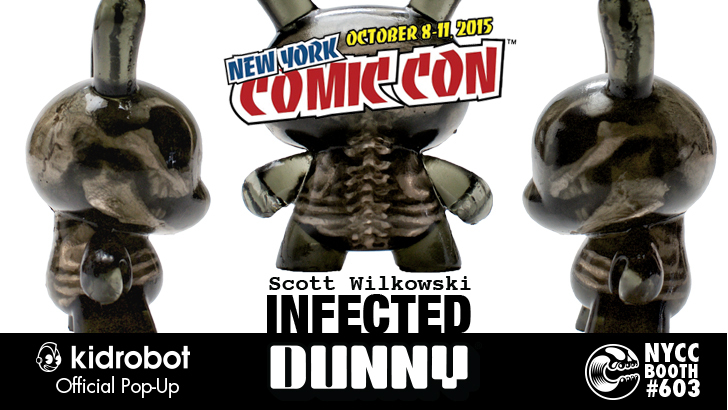 Scott Wilkowski creating an Infected Dunny has been something collectors have wanting for a long time. Now, collectors will get a chance to pickup a Scott Wilkowski Infected Dunny at NYCC, thanks to a Clutter Magazine collaboration and a Kidrobot Pop-up shop. 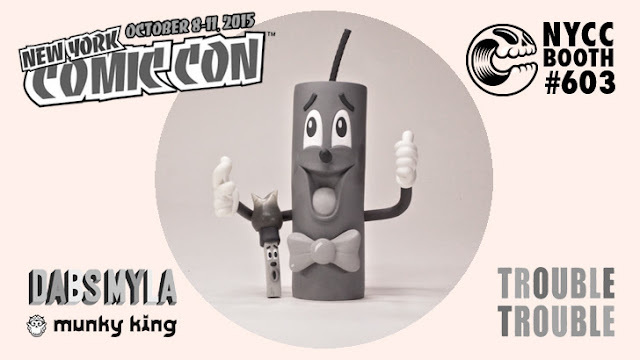 Standing at 3" tall, 2 versions are going to be available during NYCC 2015. Available in purple with a green skeleton and smoke with a grey skeleton, each version is limited to just 50 pieces. 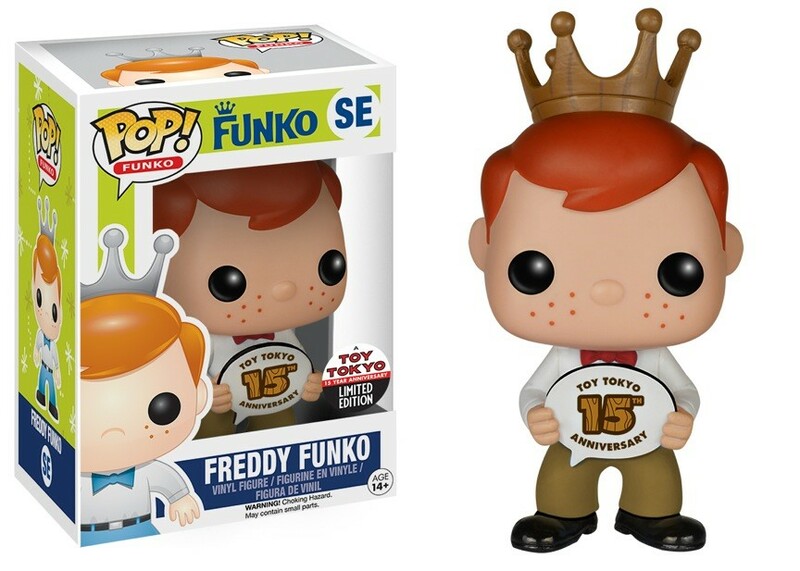 Priced at only $60 a piece, it's likely that these will sell out quickly at NYCC 2015. 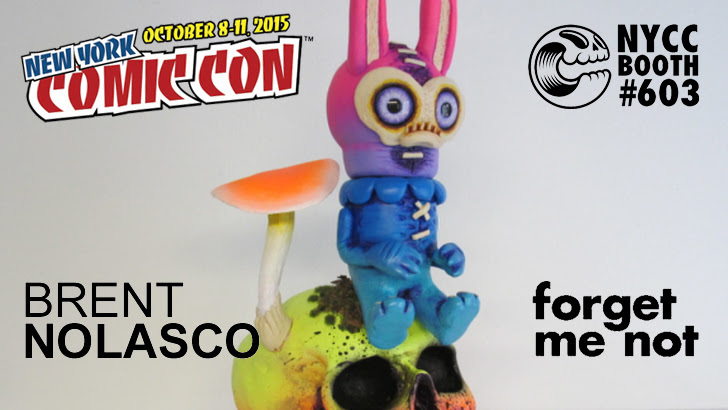 For those attending NYCC 2015, be sure to stop by Clutter Magazine's NYCC Kidrobot Pop-Up shop at booth #603. Those who are not going to be able to attend will have to hope for these beauties not to sell out, or hope that Clutter holds back some inventory for an online sale. It's finally here. 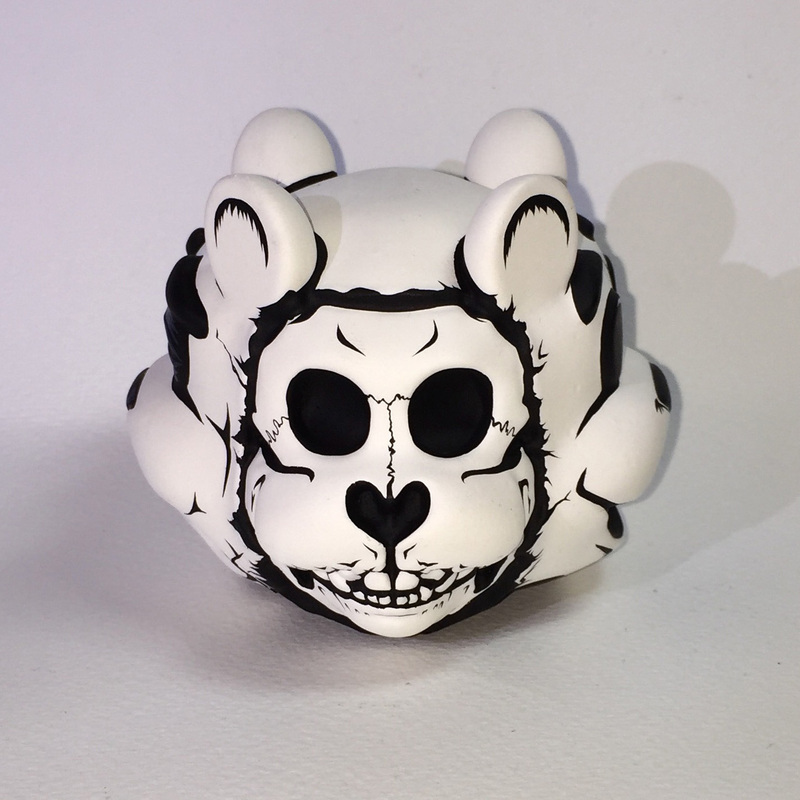 Seven inches tall, hand cast resin, small batch, designed and produced in the USA. The first batch will be available at www.HuckGee.com, today, Oct 2nd, at Noon PDT. 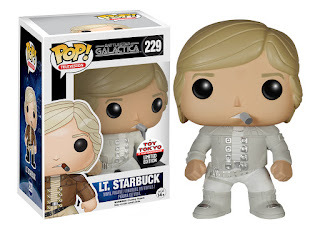 Each figure is signed and available for $75 (with free domestic shipping). This is Huck Gee's first platform figure. This is 100% Huck Gee and is long overdue. The Blank has been in various stages of development and redesign for close to 4 years. He took his time in getting the feels right. It was designed, engineered and manufactured utilizing the talent that grows in his own backyard. To cut out the unnecessary complexity of manufacturing abroad and to focus on exceptional quality goods manufactured here in the USA. 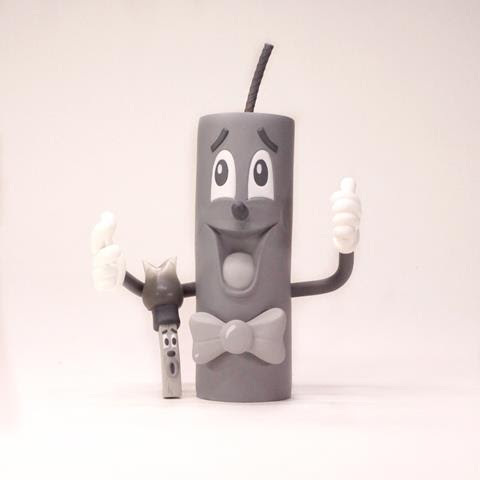 This one's for the customizers, the mold makers, the artists and toy designers. This one is for the community. This Blank’s for you. 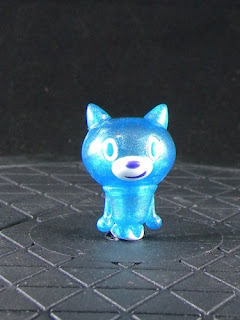 Buy TOUMA 1.5-INCH PICO MAO CAT PHOTON now! Metaluna Mutant from the Universal Monsters movie This Island Earth joins the Funko Hikari line! This extraterrestrial monster features his veiny oversized brain and vicious claws, and is limited to 1,500 pieces worldwide. The Universal Monsters Metaluna Mutant Hikari Vinyl Figure comes packaged in a numbered window display box. It makes a great gift for any Universal Monsters fan! Buy METALUNA MUTANT HIKARI SOFUBI FIGURE now! Its that time of year again, New York Comic Con, and Toy Tokyo has an exciting line-up of exclusives laid out for our fans at booth 101, October 8th through to the 11th at the Jacob Javits Center in Manhattan. 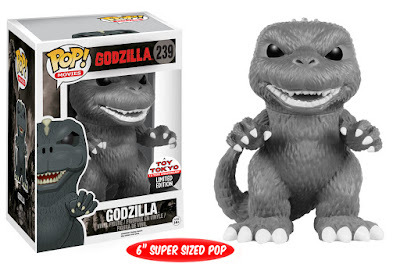 Top of the list...this is a big one...two Godzilla Funko Pop! 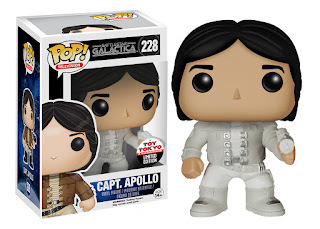 Toy Tokyo Exclusives. 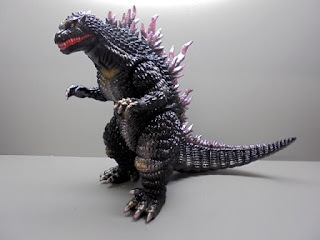 Two versions, the 1954 Black and Gray Godzilla, and a Glow In the Dark Ghost version. Each will be $30. But, that ain’t it! On top of the Godzilla Pop! Vinyls (which are a super-sized 6 inch figure) and other exclusive Toy Tokyo Funko products, Toy Tokyo is proudly sponsoring 3 of the original Godzilla costume actors at NYCC 2015 to sign autographs. Haruo Nakajima is among the three suit actors, the original 1954 Godzilla. 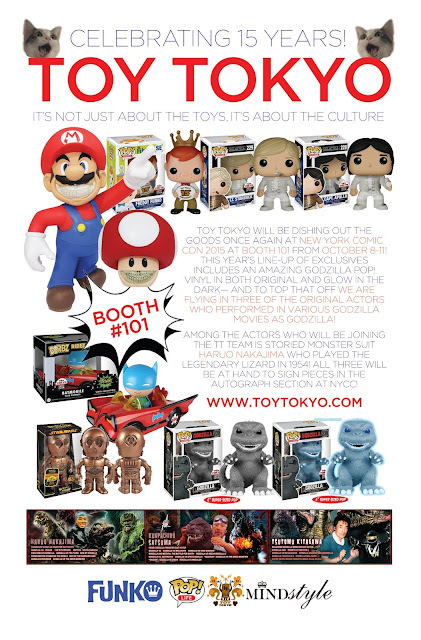 It will be truly an amazing event and honor for us at Toy Tokyo, as well as the fans. Also on hand signing autographs will be Kenpachiro Satsuma, who donned the Godzilla costume first in 1984, all the way through to 1995. And wrapping up the Godzilla suit-actor timeline, Tsutomu Kitagawa will be the third actor present for the signings. Kitagawa first portrayed to coveted role of Godzilla in 1998, all the way through to 2003...probably when CG started taking over. Autographs by the actors will be available at discount pricing with the purchase of the Toy Tokyo Godzilla Pop! Vinyl exclusives throughout the show. The exclusives are of the original 1954 Godzilla (which according to many experts, the design has “nailed it!”). If a fan purchases a single Godzilla Pop! and wants it signed by Nakajima, the cost of the signature will be $15 as opposed to $25. With the purchase of both Godzilla Toy Tokyo Exclusives, a single signature on both will cost only $25, half off of the regular price of $50 for the signing of two pieces. With a purchase of one Godzilla Toy Tokyo Exclusive, the autographs of all three actors, the cost will be $50 as opposed to $75. A $25 savings on the autographs. And lastly, the two piece set of the Toy Tokyo Godzilla Exclusives being signed by all three actors will cost only $60 as opposed to $75. All three of the actors will also be present to sign any Godzilla memorabilia for the price of $25 for each autograph...that could be posters, photos, other toys...whatever the fan chooses to bring. 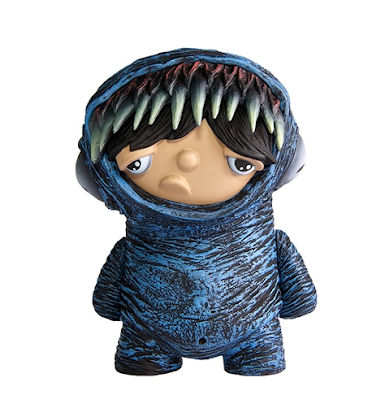 And in other Godzilla news, Toy Tokyo will also be presenting a very limited Marmit Millennium Godzilla Exclusive produced by Medicom Toy Japan. 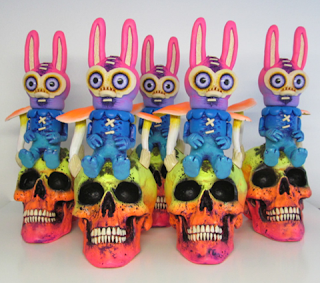 This piece has been produced in honor of Toy Tokyo’s 15 year anniversary! 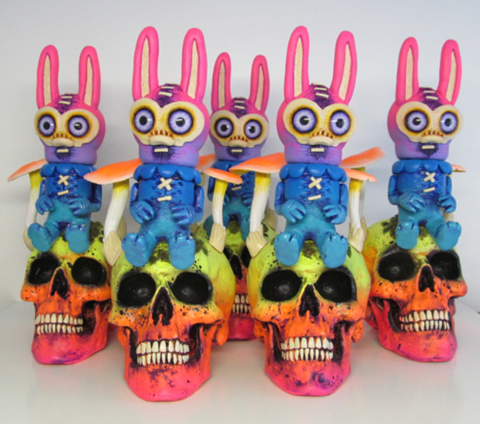 On Thursday, October 8 Master Popagandist Ron English will be signing three amazing exclusives! One of the pieces is a very recognizable video game star with the distinct Ron English twist (Mario Grin), and the Mushroom Grin. Along with a trio of Star Skulls. The signing will take place between 2pm and 3pm at the Toy Tokyo booth 101. Toy Tokyo will also be proudly presenting a selection of very cool Pop! Asia pieces. All available, of course, in very limited numbers. 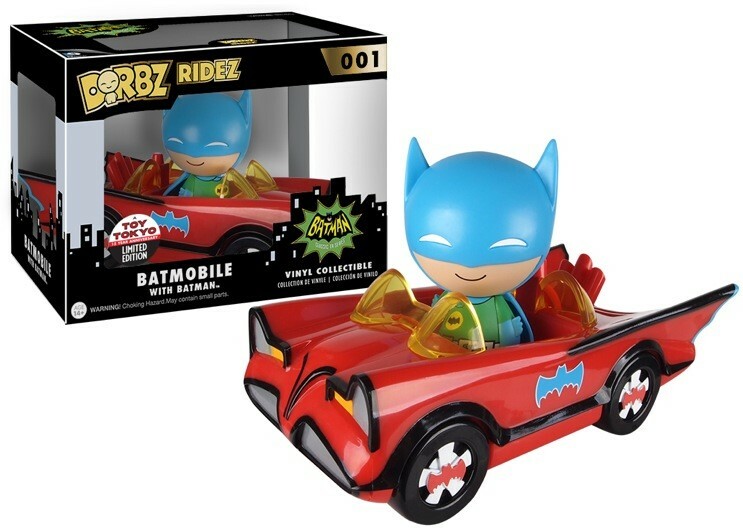 Pricing for the exclusives is currently not available for the balance Toy Tokyo Exclusives, aside from the two Godzilla Pop! 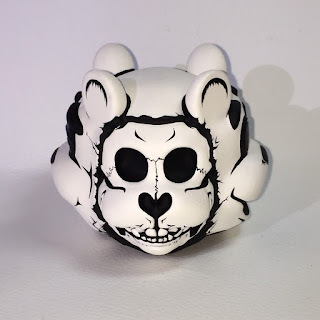 Vinyl pieces. The Toy Tokyo team is very excited about this year’s New York Comic Con, and look forward to seeing all of our loyal fans that have supported us over the years, as well as all of the new supporters we have gained in more recent years. Crummy Gummy returns to New York Comic Con only this time with some friends! 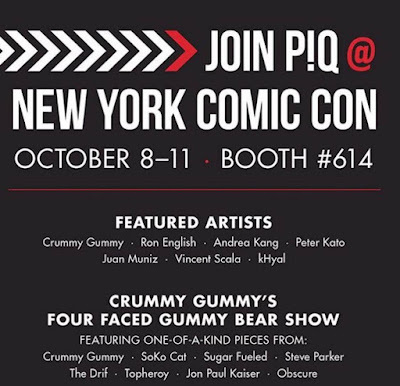 Crummy Gummy’s Four Faced Gummy Bear Show will be taking place at the PIQ Booth #614 located in the Block. 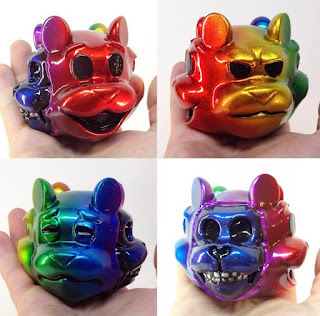 He hand selected 8 artists to customize his newest figure and the line up includes: Jon Paul Kaiser, Sugar Fueled, SoKo Cat, Steve Parker, The Drif, Topheroy, MannyX and Obscure. 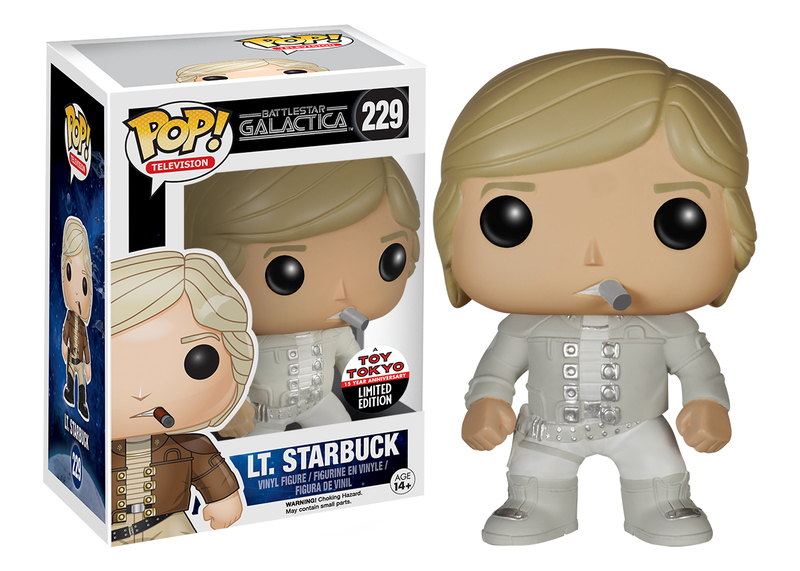 He will also be signing at the booth on Friday at 4pm. 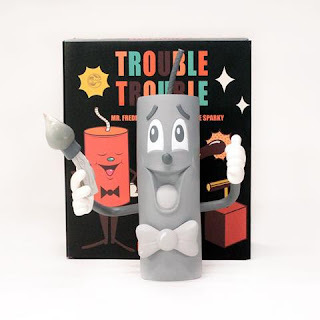 DabsMyla's "Trouble Trouble (Mono)" for NYCC! 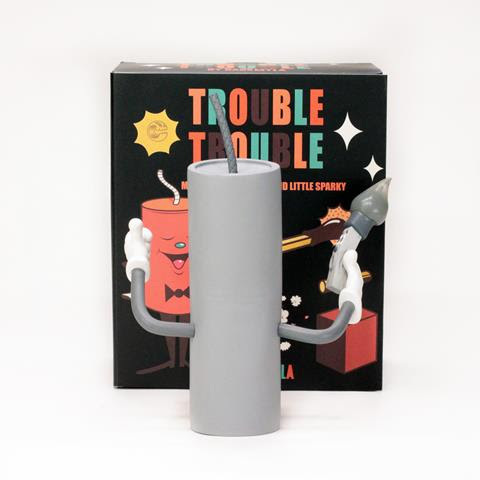 The duo of DabsMyla recently released their first designer toy, Trouble Trouble, in partnership with Munky King. Featuring 7.5" tall dynamite stick Mr. Freddy Powerful and his best buddy, the lit match Little Sparky, this vinyl figure set harkens back to the Golden Age of American animation, so what would be more appropriate than a Monotone Edition? Limited to an edition of 100 pieces, this New York Comic Con exclusive version will be available solely from Clutter Magazine's NYCC booth #603 for $80 apiece! Born into this world as a human clone baby, Nerviswr3k went thru life enjoying and admiring the left side of life, colors, taste, emotions and creativity. At the age of 12, Nerviswr3k managed to disconnect himself from the machine known as the American dream and began the long journey to creative freedom. That long journey takes us to now.......focusing on odd creatures and odd fellows, creating what in his mind is a master race that pulls the strings on modern society, controlling the media, governments, agriculture and monetary institutes. This world is a dystopian rat lab where we wait to find out who wins this rat race called life. The end. 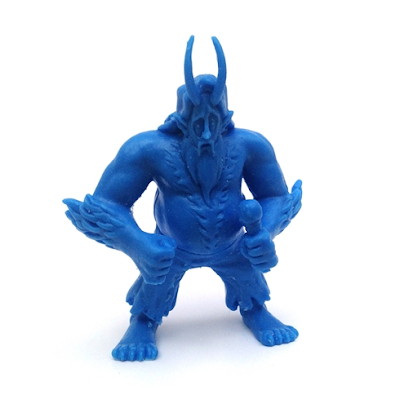 Buy THE INNER CHILD BLUE BY NERVISWR3K -TENACIOUS EXCLUSIVE now! In 2014, Stand Up! Records released his first full-length album. "Can We Afford this much Despair?" which hit #13 on the iTunes Comedy Charts. The label is celebrating the release with a special edition that includes a download code for the album, a hand-cast, originally sculpted, 3" Keshi-style mini-figure and some stunning header art. Adam is also an avid collector of rubber mini-figures, hand painted sofubi vinyl, 5.5" figures, and vintage toys. 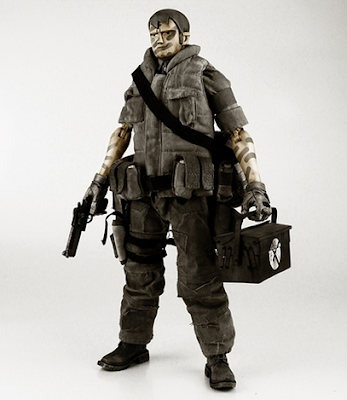 Buy TENACIOUS TOYS EXCLUSIVE BLUE DESPAIR KESHI FIGURE BY ADAM QUESNELL now! Breaking News! During an excavation in the former Mesopotamia, archaeologists found what has been dubbed as the “holy grail” of resin art figures. Archaeologists claim this is proof that the World's First Dragon has been worshipped since the birth of human civilization. Baby Fatts, the first production piece by Big C, will debut with a stone color/texture. 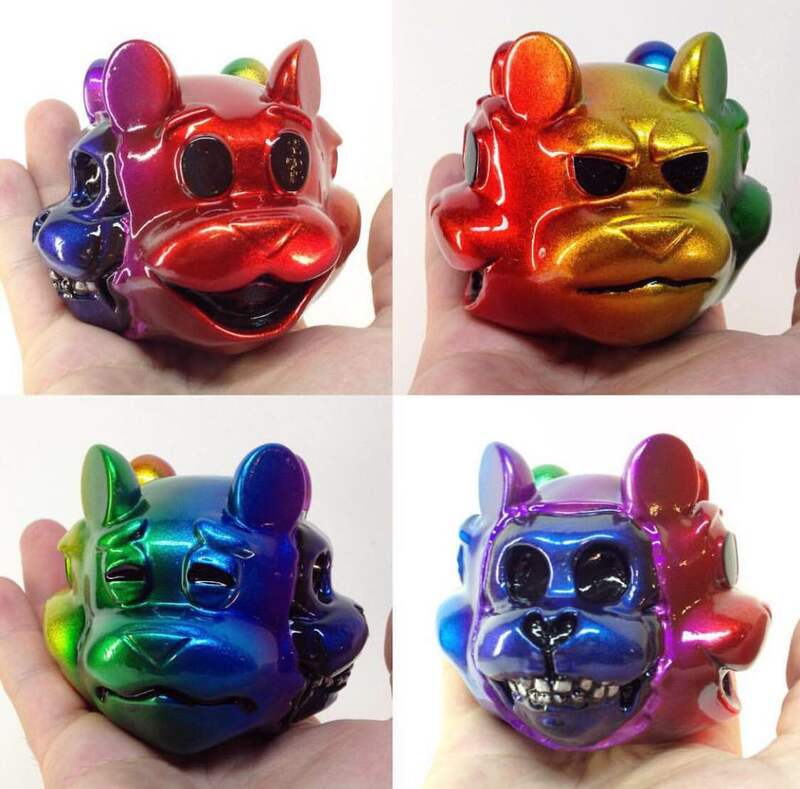 The Stone Idol edition of Baby Fatts will be a 2015 convention exclusive, limited to 10 pieces. 4 will be available at NYCC at the Tenacious Toys booth #208, and 6 will be available at DesignerCon (DCon) at the Hitsquad booth (booth #'s not yet assigned). Baby Fatts is roughly 3.5” high, 3” wide, 3” thick, and will sell for $60 each. 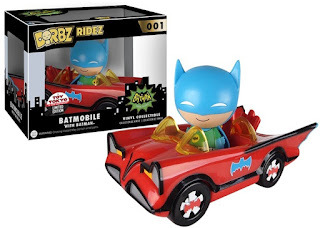 Make sure you put this “toy of the year” at the top of your convention shopping list. With only 10 total pieces available, they won’t last long. Big C is a visual artist, from the San Francisco Bay Area, who produces work as a painter, sculptor and illustrator. His work has been displayed all over the world, including the de Young fine arts museum, and San Diego Comic Con. He is influenced by his life’s struggles and triumphs. 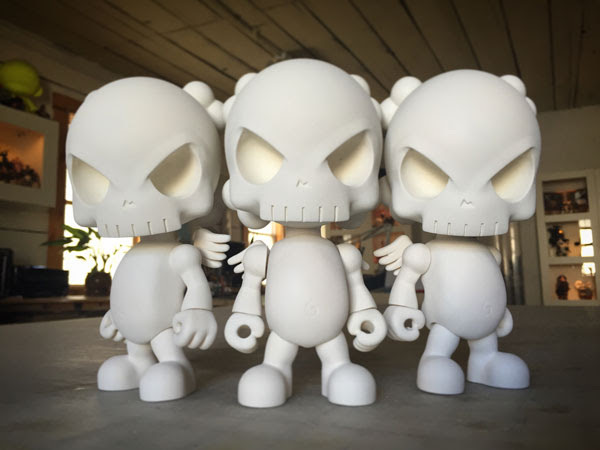 Big C loves to design toys, paint canvases and create original sculptures, but he also likes to create art out of many non-traditional objects that he sees canvases and armatures. He has many huge projects in the works. His work can be seen online at https://www.facebook.com/BigC.artwork and on instagram at @big_c_art. As always, he would like to thank you for supporting the arts. Superpowers: binge watching Netflix, while sculpting and painting. The Designer Toy Awards proudly invite everyone to join a veritable who's who of industry luminaries at this year's 5th annual DTA ceremony, taking place on the night of Saturday, October 10th. With doors opening at 8PM, it will be at the Hudson Terrace (621 West 46th St., New York, NY 10036), which is located a mere mile from the Javett's Convention Center in which NYCC is held! 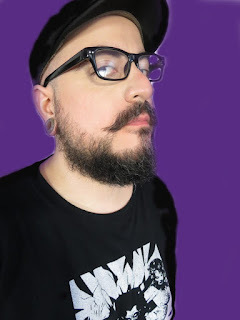 This year's DTA ceremony will again be hosted by Jesse Snider, a TV & radio host as well as comic book writer, voice-over actor, and rock musician. Snider has previously hosted MTV2 Rock and The MTV2 Rock Countdown, as well as shows on Fuse TV and HBO. Do you want to skip waiting in line? Unless you're a finalist, the only way to do that is… the Fan VIP Pass! Available free with the purchase of either a Goodie Bag (filled with at least $70 worth of goods), these are available in extremely limited quantities now for $50 apiece. Hungryghost Bob's Burgers kids Dunny set! 3 piece resin cast sets, hand painted and come in custom Bobs Burgers window box designed by SHEZ! Pazrael demon god of the lower aerial realms 8"
Yuki onna (Snow Woman) 3"
Kintaro the golden boy 3"
Jason Vorhees kitty 4"Freddy Kruger kitty 4"
Child's play Chucky kitty 4"
Shio Motarasu the Yakuza captain zombie 3"
Jet set radio's Beat 4"
Buy 3A WWR ROTHCHILD FIELD MECHANIC NIGHT FIXER JENKINS now!